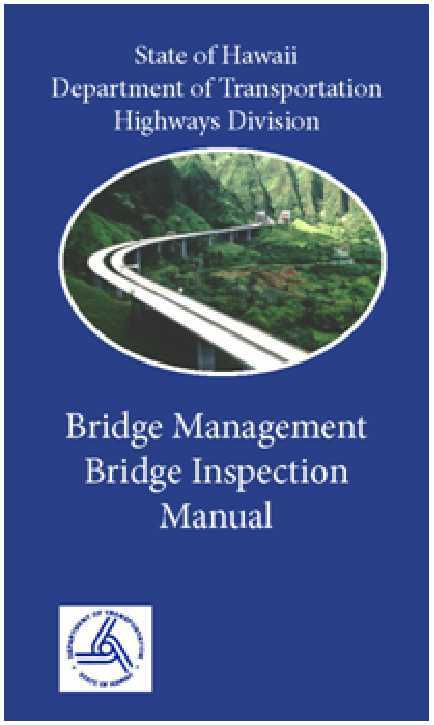 The AASHTO Manual for Bridge Element Inspection provides the information needed to perform bridge inspection using the National Bridge Elements (NBE). Federal regulations require all bridges to be inspected using NBE’s. The purpose of this manual is to supplement the AASHTO manual with Hawaii-specific information. The manual was designed as a top down approach when inspecting the bridge. This basically refers to the inspector starting the inspection on the top of the bridge and then proceeding down to the bridge substructure. Chapter 2 describes filling out the new inspection form and final report. Chapter 3 describes using AASHTOWare Bridge Management (BrM) software. Chapter 4 describes new deck elements. Chapter 5 describes new superstructure elements. Chapter 6 describes new substructure elements. Chapter 7 describes new culvert elements. Chapter 8 describes new wearing surface and protective system elements. Chapter 9 includes the NBI ratings. Chapter 10 describes using BrM to input new inspections.